It's what the Lapdog should have been all along. Remember the great living-room PC fad of 2013 to 2016? Oh, what a thrilling time that was, when we still thought Steam Machines might take off, when the Steam Controller was full of potential, and when everyone rushed to capitalize with their own miniaturized PCs and peripherals. Into that environment arrived Corsair’s Lapdog, a combination keyboard/mousepad lapboard made for couch use. It was emblematic of everything wrong with living room PCs at the time, trying to translate the entire desktop experience to the couch. Overlarge, overpriced, and wired, the Lapdog was a bit of a mess. 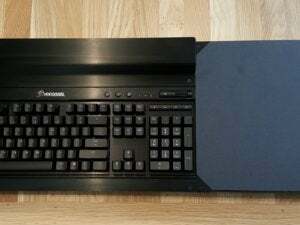 But two years later, Corsair is back with a newer, slimmer iteration of the Lapdog—now called the Gaming Lapboard—and while living room PCs are just, well, PCs at this point, anyone with a living room machine should snag one of these. First of all, it’s wireless. That’s really the only argument I feel like I need to make in favor of the new Gaming Lapboard. From the beginning, I was confused why the previous Lapdog required cables strung across the living room. It was ugly. It was awkward to set up. And most of all, it was dangerous. A tripping hazard even on your lonesome, that 10-foot cable was a downright nightmare for people with pets or children. The new Lapboard ditches the cord. Sure, wireless isn’t as foolproof as wired, but this is a living room device. It needs to conform to the living room ecosystem. 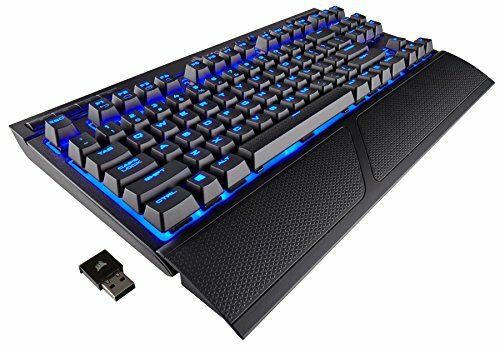 Thus it’s designed around Corsair’s new K63 wireless mechanical keyboard, with a 2.4GHz signal and about 30 feet of range. If you use a wireless Xbox One or PlayStation 4 controller in your living room without issue, the K63 should work fine. The caveat of course is battery life. The K63 gets about 15 hours of battery according to Corsair, although my own tests found it closer to 8 to 10 with the backlight in full effect. That’s still more than enough to get you through the day, so just top off at night when you’re not using it. Easy. Dimming the backlight also helps, with half-brightness lasting up to 25 hours and no backlight up to 75. And if the K63 keyboard does die, Corsair still gives you the option of plugging in. I wouldn’t—as I said, stringing a cable across my living room was the bane of my time with the first Lapdog. But you can do it. So that’s the biggest change, and the most welcome. The Lapboard is also smaller. I ditched the original Lapdog as soon as I finished the review, because it took up an absurd amount of space in my living room. Measuring almost three feet long, it was too big to slip under the couch, or next to my couch, or behind my entertainment center. It was comfortable to use, but whenever I wasn’t using it, I resented it. Corsair put the Gaming Lapboard on a diet, and the new version measures 26 x 11 x 2 inches. It’s still not a small device by any means, and definitely doesn’t compare to Razer’s sleek Turret, which folds up and sits on a shelf. It’s lost about two inches in length and another two inches in height though, and it makes a surprising difference. The height especially—much easier to stash under a couch now. I’ve been using the new Lapboard for a few months, and it feels like a good compromise. As I said, you still get a full-sized (albeit tenkeyless) mechanical keyboard in the K63, with standard Cherry MX Red switches. Way better for gaming than the tiny scissor switches on the Turret, but cutting the numpad from the old Lapdog both saves space and puts the mousepad in a more natural position. Win-win. Speaking of, the cloth mousepad is still plenty large. Low-DPI users might have a bit more difficulty, because it’s not really built for the sort of sweeping side-to-side arm gestures you’d use in shooters, for instance. At 11 inches wide though, I haven’t had much of a problem. Again, it’s certainly closer to a desktop experience than the 6-inch mousepad on the Turret. Corsair recommends pairing the Lapboard with its own Dark Core SE wireless mouse, of course, but really any wireless mouse will do—it’s feeding direct into the PC, not into the Lapboard. It’s way easier to set up this time around too. In fact, you might actually take the K63 out of the Lapboard once in a while—something I definitely wouldn’t say about its predecessor. Installing a keyboard in the original Lapdog entailed removing a bunch of screws, plugging the keyboard into place, then replacing the panels over it. It looked clean when finished, but took 5 to 10 minutes every single time, and basically meant you needed a dedicated K70 for the Lapdog. It was ludicrous to think someone would unscrew the entire chassis every time they wanted to move the keyboard back to their desk. But the new Lapboard? Tool-free installation. The K63 simply snaps into place with a pair of small tabs on the back, and then pops right back out again. I still think you’re better off buying a dedicated K63 for the Lapboard, and indeed Corsair’s own site implies that’s the way to go—you’ll save $10 on the price. You could conceivably use the K63 with two machines though, moving the wireless dongle back and forth as needed. Pretty cool. Corsair’s new Gaming Lapboard is a real winner. The last time we reviewed the Lapdog, I said it took a no-compromises approach to living room gaming, but that a few compromises might’ve made for a better product. Now I can definitely answer that in the affirmative, as this second-generation version does make those compromises and is absolutely a better product. It’s large enough to still bring high-performance PC gaming into the living room, but small enough that you might actually want to keep it around. That’s all I could really ask for. Whether you need one? Well, I don’t know. Do you even have a living room PC? That’s the first step, of course. After that, it’s just down to whether you’re prepared to spend $60 for the convenience of a tailor-made product, instead of resting your mouse on an old hardcover book or whatever you’re doing right now. Personally, I think the Gaming Lapboard is worth it, and it’s a substantial quality-of-life upgrade—but you’ll have to make that call yourself. Slimmed down and wire-free, Corsair's new Gaming Lapboard is what the oversized Lapdog should've been all along: Excellent for living room gaming, while still a proper living room device.